GSR Journals of Palliative Care is has a humongous collection of papers, which are often very rare. Palliative care is comparably a newer branch in medicine though the strategy is very traditional. The vitality of this branch has led a large number of studies and researches, which in turn tailored modern methods of palliative care, counselling, pain alleviation techniques and medication, in bed meditation etc. GSR entertains palliative papers in order extend the meadow of reach to all sections of the medical society. GSR Journals of Palliative Care opens a better chance of updating the traditional knowledge from books. Frequent uploads of studies & journals from all over the world will ensure a better torque in the field, which in turn will motivate the rest of community to take the study to next level. All the paper on GSR is double blind peer reviewed to guarantee credibility and a group of experts will validate the contents being published. 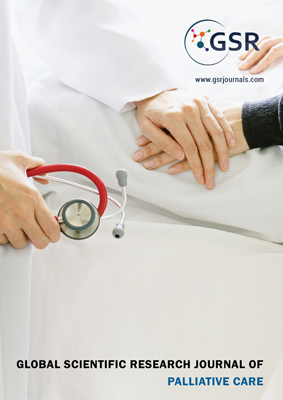 GSRJournals of Palliative Care publishes original research, latest developments,review papers, scientific data, editorials from leading scientists and scholarsaround the world including but, not limited to the following subjects orrelevant fields.